This monograph examines the possibilities for diagnostics of light-scattering objects and media by utilizing the properties of coherent optical radiation. Special emphasis is placed on diagnostics of rough surfaces. Ideas formulated in classical work on statistical radiophysics and optics have been adapted to diagnostic applications. 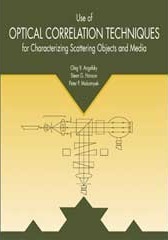 The text includes unique techniques and unconventional methods aimed at obtaining the maximum information available. Optical methods are known to provide some of the most important information obtained in studying the surrounding world. The amplitude, phase, polarization, spectral, angular, and correlation characteristics of optical fields may carry vital information on the objects of interest. Modern fast-acting optical processing systems are capable of collecting information on diagnostically important parameters with high efficiency. This is primarily achieved by means of parallel processing of large amounts of data and by taking advantage of analog optical computing devices. The problem of metrology of random optical fields, such as speckle fields resulting from the interaction of laser beams with a random phase object, has a significant place in optical diagnostics and optical recognition studies. These problems range from astronomy to industrial quality control. In the present monograph, consideration is given to interference, polarization interference, and holographic correlometry of amplitude and phase parameters of random optical fields for the purpose of subsequent diagnostics of the appropriate objects and media. An attempt is made to show the possibilities for a diagnostics of light-scattering objects and media provided by utilization of the properties of coherent optical radiation. The diagnostics of rough surfaces, being of great importance for many branches of industry, is particularly emphasized throughout the monograph. An important feature of this monograph is the adaptation of the ideas formulated in classical work on statistical radiophysics and optics to diagnostic applications. At the same time, the proposed diagnostic techniques are aimed at obtaining the maximum information on objects, such as the roughness height (or phase increment) distribution functions for random phase objects, size distribution functions for dispersive systems, or root-mean-square velocity distribution functions for Brownian particles. Some of the diagnostic methods considered are unconventional. The proposed group of unique techniques for interference measurement of statistical moments of the field amplitude and phase up to the third and fourth orders constitutes a particular class of statistical methods for interference correlometry of optical fields. Most of the methods discussed result from physical modeling.